it isn’t as important what direction the sensitivity goes as it is the range the sensitivity can be accurately predicted to, at least from a scientific standpoint. the narrower the range the more precise the knowledge. my point was the range was so wide that currently the very people that are termed deniers could be closer to the truth if the truth turned out to be in the low end of the range then those that are predicting the high end of the range. if the data does not support the low end of the range then perhaps a good starting point would be to support the raising of the low end of the range. Steven, you are misunderstanding the situation: The probability to the left of 1.5 is near zero. The probability to the right of 4.5 is not negligible. This is extremely important both from the point of view of science and risk assessment. Look up “thick-tailed distribution” and the term skew as it applies to probability. no, I understand exactly what you are saying I think..not that I know the exact statistics but lets say you come up with a 1% chance of 1.5 but a 15% chance of 4.5…wouldn’t this be what you mean? let me rephrase that. if I know what a skewed bell curve looks like then that is what I would be looking at when viewing the climate sensitivity probabilities, correct? Correct, the rate of warming is not in dispute – it’s decidely negative and will likely continue that way for some time to come! The warming trend observed in the 1990’s has more to do with less aerosols in the atmosphere and a more active sun. This is a better explanation than CO2-driven climate change for the following observed phenomena: cooler stratosphere and warmer surface temperatures (particular areas over land in the northern hemisphere, such as across Asia where the former Soviet Union dissolved and China has modernized). What happens to the impact of CO2 in the climate models if the assumed amount of aerosols are cut in half, or more? Plus, throw in some minimal mechanism for a more active sun. How much of the CO2-driven temperature rise is eliminated once these assumptions are made? It’s my understanding that the role of CO2 has increased over the years primarily to account for more aerosols assumed in the models. Why? Just to prop up CO2? In fact, I have seen two published articles(posted on Atmoz and WUWT) that suggest the opposite: the air is cleaner today than 30 years ago. Yet, the climate models assume otherwise. Go figure. I am still a bit confused by where the graphs came from. from what I read it seems there were produced by the person who runs the open mind blog? I tried looking for a chart that looked similar in the ipcc report but was unable to find one. it may be there and I will attempt another look later. You, like so many other skeptics have fallen victim to what I call the Chinese menu fallacy: You assume that if you can just find other causes for warming that aren’t in the current models that the whole nasty business with CO2 being a greenhouse gas will go away. It won’t. Greenhouse forcing is not an adjustable parameter–it is fixed–and pretty narrowly–with independent data. So are the other forcings–with varying success. The parameters that are poorly fixed are aerosols and clouds. Find a new forcer, that’s were the give can occur in the models. No one is propping anything up. They are merely doing what the science tells them to do. Steven, Given the shape of the curve, do you see why I am saying that the climate studies (which take ~3 deg/doubling) have been conservative. The cost of climate change to civilization probably rises exponentially with increasing temperatuer, so in reality, the risk (cost times probability) is dominated by that thick tail on the right side. The evidence says the denialists are almost certainly wrong, and it cannot rule out the scenarios of the alarmists like Lovelock and Hansen. In this sense, “alarmist” is not a pejorative. If sensitivity is 6 degrees per doubling, alarm is the only appropriate reaction. I haven’t read anything about what lovelock has said but I do have a familiarity of what hansen has done and that is that he has taken a climate sensitivity of 3C to be the immediate effect and then an additional 3C as a long range effect. this would be based on things such as less ice and snow, methane release, and darker vegetation further north. this hypothesis may seem very ominous on it’s face but actually it may be exactly the opposite since then one would have to go back and apply the same long range forcings to the increases in solar radiation which would decrease the amount of unaccounted for temperature change currently being placed on co2. having just read the response from real climate to his paper and some of the postings there it was also pointed out to me that some of these long range responses are also limited by their nature and that the long range response would actually be less with time. ie there is a limited amount of ground that could be uncovered and a limited amount of methane that could be released. I don’t have the skill to figure out what exactly applying this hypothesis to earlier solar forcing would result in but should it ever be done or if it has been done I would find it of interest. some of this I said in an earlier post. I apologize in advance for being some of this being repetitive. On Miskolczi and Kirchoff’s law, Kirchoff’s law means absorptivity and emissivity must be equal *only when considering the same frequency. * Earth’s visible absorptivity is 0.7, but the emissivity is not– just the visible emissivity. Steven, Climate models are not Chinese menus. The sensitivities of CO2, solar irradiance, etc. are determined by independent data–not by fitting to the temperature rise. If there is an unaccounted for forcer, CO2 forcing, which is tightly constrained, will not change. Less well constrained forcers, such as aerosols, clouds, etc. have some give–not CO2. I agree there is a set forcing from co2…I believe it has a range from .8 to 1.2 from what I read although I may be marginally off. what I am discussing is the feedback mechanisms which are not set nor are they well understood as fully exemplified by the ranges in climate sensitivities. is this not correct or am I missing something? Is “climate sensitivity” to CO2 an independent variable? The following graph shows aerosols have two effects: one direct and one indirect (via albedo). I assume that is the case for CO2. Although CO2 sensitivity is not a forcing component in the strict sense, it is one nonetheless via the embedded formulas in the climate models. How can you say CO2 is an independent variable when it has a supposedly indirect effect (via climate sensitivity)? 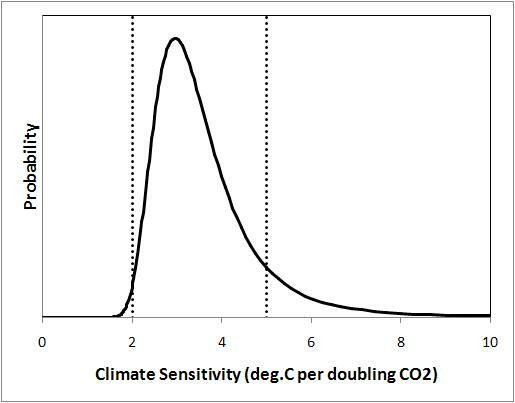 Does not climate sensitivity depend on other variables? Also, you didn’t answer my question: Why do climate models assume there are more aerosols today than the past decades (please see graph below). Further, what are the accuracies of the models if the assumed amount of aerosols are cut in half? I can only assume they wouldn’t be accurate at all. So, one would either conclude that aerosols are “propping” up the role of CO2, or the models are not accurate at all. You can choose the best description. I contend that my hypothesis (less aerosols, more active sun) provides a better explanation for observed results (cooler stratosphere, warmer land surface temperatures) than any climate model. Until you guys provide better results, your sense of creditability appears ill-founded at best. Finally, I see two Chris’ on this site of late. I’m Chris N.
Remember, if you think you might be retyping a FAQ, try typing it into the Search box at the top of the page. You may find you’re right. Also the “Start Here” link at the top of the page is handy. Chris N., I’m not sure what you are talking about. Where do you get your information that climate models are assuming more aerosols today than in the past? That is a rather vague accusation that sounds as if it is taken out of context. Now, how, pray does your model account for a cooler stratosphere? And it certainly doesn’t account for the fact that there is more warming in night-time temperatures than day-time temperatures, or any of a number of other trends. It sure makes the problem easier when you only pick a subset of the trends to fit. I think it is your understanding of the models that is ill founded. Steven, I think you will find that the sensitivity was raised because independent data favored the new value. Raising the sensitivity in response to temperature trends would be ill advised, because you then could not use temperature trends as validation for the models. Sensitivity is not an adjustable parameter in the models. It may vary over time, but only as new data come in to support different sensitivities. Steven (aside, the shift key would really help, if you find it easy to use, both to make quotation marks before and after quoted material, and to make capital letters that help indicate when you start sentences. Paragraphs also help organize thought, as others have mentioned, for those of us with older eyes. If you can’t do that easily I understand, but if you can it’d be a kindness. You wrote: “treat the two forcings of solar and co2 in almost exactly the same manner” — I’m not sure who you’re talking about doing this, the modelers? the politicians? — we don’t have control over the sun. Solar input is only changing by about one watt out of thirteen hundred watts per square meter, not a whole lot. — we do have control over CO2, which we’re doubling on the shortest time span by far ever in Earth’s history. I’m trying to figure out what point you are trying to make. Can you make it explicitly? Imagine a world in which solar output was going up, CO2 concentrations were static, and the atmophere was warming at an alarming rate. Would fatalism be the order of the day or would someone hit upon the happy idea of reducing CO2 concentrations in the atmosphere as a way of mitigating the effect of the increasing solar energy? The higher the value of the long term feedback the smaller the value of the immediate feedback must be. I know I have oversimplified to an incredible degree and this is not up for peer review so please don’t be too harsh but I hope it got my frame of thinking a little more clear. Imagine a world in which solar output was going down, CO2 concentrations were up, and the atmosphere was cooling. Would fatalism be the order of the day or would someone hit upon the happy idea of increasing further CO2 concentrations in the atmosphere as a way of mitigating the effect of the decreasing solar energy? Steven, OK, so what was the past forcing you posit is still reverberating today? Changes in insolation have been tiny. Other influences have been short-term and inconsistent (some positive, some negative). Did you ever study differential equations? Think about how the time dependences of the homogeneous and particular solution have to be related to see a consistent, monotonic effect. To paraphrase raypierre–the sun goes up and down and up and down, and temperature (trend) goes up. Look, it comes down to this: the energy has to come from somewhere. Where do you think it’s coming from. In any case, the fallacy of your argument is that somehow, CO2 forcing is determined from current forcing. It isn’t. It is determined from things like paleoclimate, past response of the atmosphere to purturbations, and so on. They are saying, “the sensitivity has to be x, because in the dim and dark past we saw y.” So unless you can produce y with a much smaller sensitivity in the dark and distant past, CO2 sensitivity in the models won’t be affected. CO2 sensitivity in the models is not a fitting parameter. It is fixed by prior information. My point wasn’t that long term feedback was a significant cause of the current climate. It was that if it isn’t, and it seems obvious that you believe it not to be, then there is no reason to believe it will be in the future. Steven–the problem is that in the past we didn’t have a rapidly increasing driver that would have effects that persiste for hundreds of years, and the system’s response to large perturbations may be quite different from the response to small perturbations. Past perturbations were not sufficient to melt the ice caps. This ome might be. In the past, permafrost stayed frozen; now it is melting and releasing CO2. In the past, the ocean remained a net sink for CO2, but now its ability to absorb is diminishing. Believe me, I have looked for warm fuzzies to convince me that we don’t have to worry about that thick positive tail. I haven’t found them. I’m not sure why you are challenging the credibility of Gavin ( a highly published and renouned researcher) or anyone else when your questions and assumptions make little sense (how does an increase in the sun lead to strat cooling from a radiative viewpoint? What is “what are the accuracies of the models if the assumed amount of aerosols are cut in half?” supposed to mean?). Your questions on forcings and sensitivity seems very ill-posed or confused. Adding CO2 is a climate forcing, not a “sensitivity.” The sensitivity tells you how much the climate changes from x amount of forcing. A climate with a very high sensitivity will change a lot from x forcing, and a climate with low sensitivity will change very little for the same x forcing. For example, if the radiative forcing from some increase in CO2 is 2 W/m2 and the climate sensitivity is 0.75 Kelvin per W/m2, then adding that amount of CO2 will give 1.5 K increase. Only someone who hated fish. And plankton. You know this. My tone AND math was off. Lashings of apologies. I’d intended a clever rebuttal to the fatalism inherent in the “nothing we can do” position of the idea that solar increases were responsible for AGW. Well, of course we could and would do something. Like tinker with CO2 concentrations. Maybe. But mentally I’d switched the sign. Up was down. Etc. Hard to explain. Like calling your best friend the wrong name. We appear to be talking past one another. My comments are two distinct points but somewhat related. First point: Less aerosols in the stratosphere will cause it to be cooler, all else equal, than a time when more aerosols are in the stratosphere. Thus, the present trend of cooler stratosphere is due to less particulate matter reaching the stratosphere today than 20 or 30 years ago. Regarding the models themselves, would they still be “accurate” if the aerosol forcing is cut in half? It appears to me that the aerosol forcing has been inflated in order to get the CO2-driven models (with their inherent climate sensitivities) to reasonably match surface temperature trends. According to this graph, it appears that aerosol forcing in the models has been incresing over the years, not decreasing. If you think I don’t know what I’m talking about, please explain the graph above. Jeffrey Davis #181, …but your valid point is that natural disasters may be as bad as self-inflicted ones, and their mitigation just as legitimate. The fact that a very damaging development is “not our fault” — well, AGW is, but think asteroid impact or whatever — is no reason to just suffer it. Fatalism is a curse, and 100% self-inflicted. Are these equations meant to represent a theory you have? Or do they come from some source you can cite? It looks as though you are assuming there that present conditions are equal to past conditions. Spencer Weart goes through the science done to test that assumption, in considerable detail. They were just equations I made up to try to make my line of reasoning a bit clearer. The point I was trying to make isn’t that things are the same as they were but rather that the long term climate sensitivity shouldn’t change that much. Thus if you predict a high long term sensitivity for current forces it would make sense to go back to past forces and use similar climate sensitivities for those and see how they should be affecting today’s climate. I understand I grossly oversimplified but it was the best way I could think of to show my line of thought. I will make it a point to read what Spencer Weart has done. In #117 above I sought a response to a paper for which Roy Spencer was the lead author. It now appears to have also included Christy as a co-author and claimed a response of tropical cirrus clouds that should require modellers to lower sensitivity value by as much as 75%. Now Spencer is claiming that the climate science community is ignoring their results. (See “The Sloppy Science of Global Warming” posted March 20, 2008 on “Energy Tribune”). “By analyzing six years of data from a variety of satellites and satellite sensors, we found that when the tropical atmosphere heats up due to enhanced rainfall activity, the rain systems there produce less cirrus cloudiness, allowing more infrared energy to escape to space. The combination of enhanced solar reflection and infrared cooling by the rain systems was so strong that, if such a mechanism is acting upon the warming tendency from increasing carbon dioxide, it will reduce manmade global warming by the end of this century to a small fraction of a degree. Our results suggest a “low sensitivity” for the climate system. Published in: GEOPHYSICAL RESEARCH LETTERS in August, 2007. I don’t put a great deal of stock in what Spencer and Christy do but I would like to see some authoritative response to this paper. Spencer and Christy don’t have a great track record when it comes to producing results that are accurate the first time round. In part, that is likely due to the difficulty of hammering the sattelite measurements into order. However, his insistence on doing science by press is inexcusable. If his paper has merit, that will come out, but to claim to have overturned climate science and complain that you aren’t getting the attention you deserve is kind of sad really. Ted Nation (186) — I’m certainly no authority, but the global temperature may have been hotter in the mid-Holocene than now as certainly hotter than the global temperature in the 1950s. The Eemian interglacial (termination 2) is thought to have been quite a bit warmer than that, with termination 3 even hotter. So spencer’s iris effect, if adequately proven to actually exist, does not appear to keep temperatures from rising a substantial amount more. At best, IMHO, this could only lower climate sensitivity most modestly, say from 3.0 K to 2.9 K.
Thank you for responding to the Spencer, Christy, et. al paper but I’m looking for something authoritative. This paper is out there bouncing around among skeptics and deniers without rebuttal. (The latest is the Australian, Jennifer Marohasy). I thought this kind of thing was partially what Realclimate was set up to respond to. I’m familiar with the long dispute regarding satellite temperature data and how it was resolved with Christy forced to acknowlege errors in his data. However, while the errors were unrevealed, others marshalled the evidence on the other side. I realize that it may be some time before independent analysis is done on the data from the new satellite but an authoritative listing of catradictory evidence is called for. where termination 2 is about 125 kya, termination 3 is about 240 kya and termination 4 is about 325 kya. All three show higher temperatures than at present. Your point about the error bars is correct. But I’m not sure it’s clear to the typical reader. I posted a version of the text below on another board and got the comment that it was a lucid explanation of the statistical issue. I thought it might be helpful to try to post it here. The Douglass et al. error bars tell you that you have a fairly precise estimate of average prediction, but they do not tell you that you have a very precise prediction. That’s the conceptual mistake they made — they confused the accuracy of their estimate of the average prediction with the accuracy of the prediction itself. A simple example can make this clear. If I ask 1000 economists to predict the average rate of inflation in the year 2100, and take the average and standard deviation of those predictions, what I’ll get is a fairly precise estimate of the average prediction. What I most assuredly do not have is a very precise prediction. In fact, it’s still just a guess. I should have no expectation that the actual inflation rate in that year will be close to that prediction. And if I then asked 100,000 economists, I’d get ten times more precision in my estimate of the average prediction. But the prediction itself would be no more accurate than the first one. To recap: they mistook the accuracy with which they estimated the mean prediction, for the accuracy of the prediction itself. That’s like saying that if you ask 100x as many economists, you’ll get a 10x improvement in the accuracy of your economic forecast. Nope. You’ll get a 10-fold improvement in your estimate of what the average economist thinks, that’s all. There’s a blog entry at climate-skeptic.com that claims to poke holes in this post. I worte in comment #190 “at present”. In this context “present” is the year 1950 CE. Also, it’s always worth pointing out that the satellite “channels” do not represent the actual temperature trends at those altitudes, but the trends of huge swaths of atmosphere that include the stratosphere to various degrees (except for TLT). The “channel” that is centered on the “hotspot” (RSS TTS — only reliable since 1987) is half troposphere and half stratosphere, a fact that is seldom (never) pointed out by people pushing this grab bag of nonsense.